A few weeks ago I got an email with an invitation for an "ArtRave" party hosted by Lady Gaga and Jeff Koons. Although quite mysterious, and indicating that further details were to be revealed closer to the actual date of the party, the whole thing seemed like a lot of fun and an adventure that I was gladly willing to take on. A follow up email came on Saturday morning requesting that we take the ferry boat on Sunday night at around 8:30 pm from the pier located on 35th Street and the FDR. The instructions stated that we were to be taken to an undisclosed location where the "ArtRave" was to take place. The ferry took us to the Navy Yard Complex in Brooklyn where we were greeted by several security people who escorted us through a massive glass house where the party was about to start. The first thing I saw after entering the glass house was a giant Jeff Koons' sculpture of Lady Gaga cast in a classic style and giving birth to a stainless steel shiny blue gazing ball. 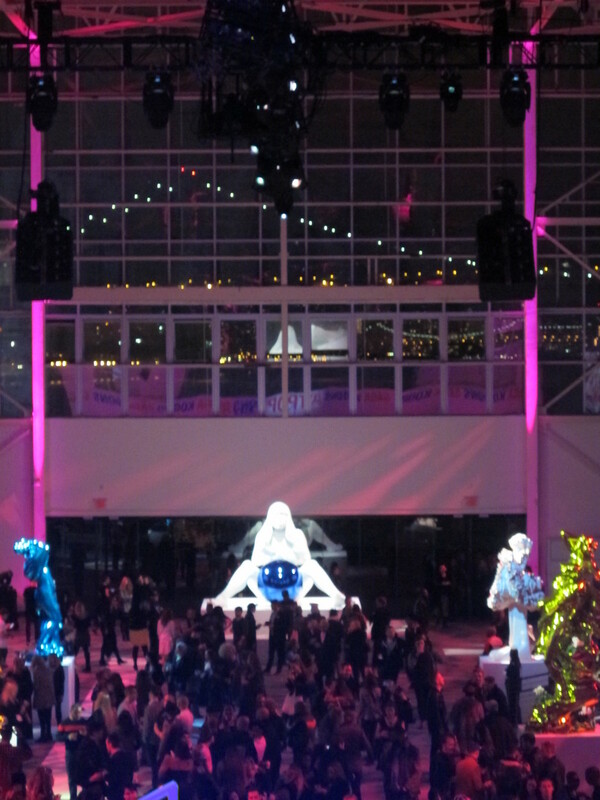 There were also several other Koons' stainless steel sculptures that had never been shown before. A massive stage that looked like a wedding cake stood on the back of the room. Upstairs, right behind the stage, was a VIP room, where we were directed by the security staff. There, a beautiful installation of eight photographs by Inez & Vinoodth, showed a series of portraits of a romantic-yet-creepy Gaga covered with flowers or a blindfolded version wearing the strangest grillz I've ever seen. The view from this room was quite spectacular and the Williamsburg Bridge served as the perfect backdrop for this Contemporary Art-Pop Music-Performance experiment. Benjamin Rollins Caldwell, who designed the famous "Binary Chair" used by Lady Gaga in so many of her "ArtPop" promos, also devised a very ingenious room called "Living In the Computer Age" which was entirely made with chips, motherboards, wires, computer parts and of course, the chairs and table that have called so much the attention of the media in the past few weeks. Gaga performed her entire ArtPop for a few hundred lucky fans and wore a "flying dress" called "Volantis". So many things were happening at the same time last night, it was really hard to see what was relevant, what wasn't and how to make these events more engaging for both people in the art community and people in the entertainment industry. I applaud Gaga for taking a step ahead and for her boundless originality and creativity. I also give an enormous credit to the artists who want to play along and bridge the gap that exists between younger generations and the old guard that wants to keep the contemporary art world impenetrable. If an "ArtRave" is what it takes, I'm all for it.